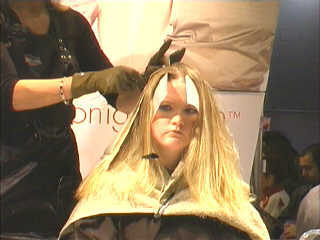 Join us for all the exciting action as these beautiful young models get their hair cut at this year's hair show. 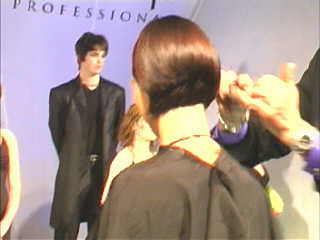 This model sits calmly as the stylist grabs a handful of hair and starts to work. 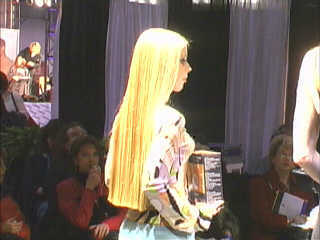 This model is showing off streaks of obviously colored hair- VERY POPULAR this year. Expect to see a lot of this stuff, at least in the bigger cities this summer. 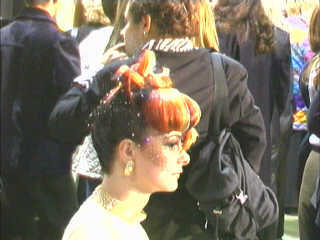 This year's show featured a $10,000 UPDO contest- very cool super-formal styles- stuff you don't see at the mall. Coloring is being done this year with these BIG WHITE SHEETS. 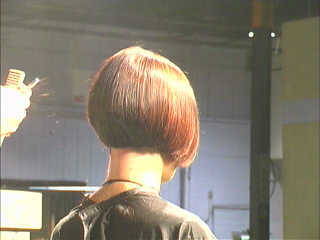 This stylist is putting the finishing touches on a soft, shapely bob. It's a little hard to see from this picture, but this model has a streak of very dark- almost black hair in her bangs- pretty cool. 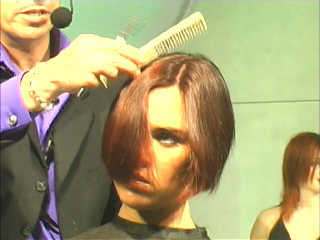 The razor is used to put the finishing touches on this style. Curly hair lovers will be happy to know that we're seeing more perms and curly hair this year. Short hair lovers will also be happy to know that we're seeing more and more hair on the floor this year. Did we mention the $10,000 UPDO contest? This model shaved off her bangs and sideburns in the hopes of being the winning entry. Here, the models sit very still as the judges wander among them to decide who will win the $10,000 prize.